Products scale quite nicely than you. While I'm beating the bushes 24/7 at Sendside, I've got some systems in place around launching products that's working quite well, and it's all built on the premise that incremental value is scalable only around products, not services. I think I know something about this. After all, I was a painter for about 20 years. Artists have perhaps the poorest business model there is. Painting is a huge time investment and you'll need some serious inventory with no assurance that what you're doing will sell. At least to start. But before I wax too philosophic, let me come back to my point. Products scale. So my crack team organized under my medical spa site at Medical Spa MD is busy creating value by leveraging our expertise to take specific products to market. Last year we launched a new site that ships wholesale Botox worldwide. In the next month we're launching three new services: Teeth whitening, medical outsourcing, and do it yourself SEO. There are about eight other products, services, and partherships lined up behind those. And that's just for Medical Spa MD. I've got designs on the artist, painter, headshot photography and actor markets in NY and LA since I've got some experience there as well. While I'm not quite at the four-hour work week with these sidelines, I'm probably close to eight... and I work on weekends. Of course I couldn't do this myself. I have a team that reside in various locations around the world; California, New York, India... And they do the heavy lifting. I'm just around to provide direction, and to pay the bills. Fortunately, with scale comes profitability. Among the most interesting posts I've ever read. 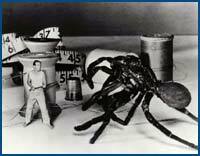 Michael C. LaBarbera, professor in Organismal Biology & Anatomy & Geophysical Sciences at the College of the University of Chicago, has written an unbelievably interesting piece about the science behind horror movies like King Kong, The Incredible Shrinking Women, Them, and Fantastic Voyage. An incredibly interesting read. ... Back to King Kong. 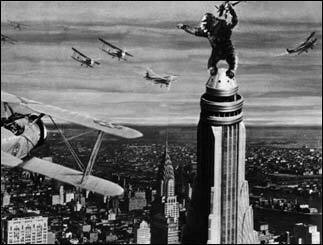 Based on some measurements from stills from the original movie, at the beginning of the movie Kong is about 22 feet tall, but by the time he climbs the Empire State Building, he appears to be 50 percent bigger, presumably because he was allowed bananas ad libitum. At 22 feet tall, Kong is about four to five times the size of your garden-variety lowland gorilla. A fivefold increase in height implies a 25-fold increase in bone cross-sectional area and a 125-fold increase in body mass; the stress on the bones thus should be about five times greater than the stress on a normal gorilla's bones. But, remember, according to Andy Biewener's data, a safety factor of five is extreme for mammals; Kong's excessive body size should have exhausted the safety factor. True, Kong stands a bit straighter than the average gorilla so he may gain a bit of the safety factor back, but it's clear that he's pushing the envelope. Is that why he has such a short fuse and is always roaring and bashing things? Not only does he continually run the risk of breaking his legs, but undoubtedly his feet hurt.